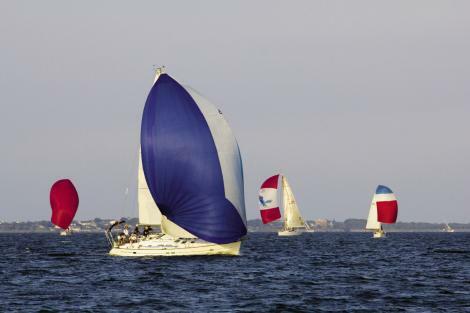 The fleet depends on colorful spinnakers for speed when they are sailing with the wind 90 degrees or more off the bow. 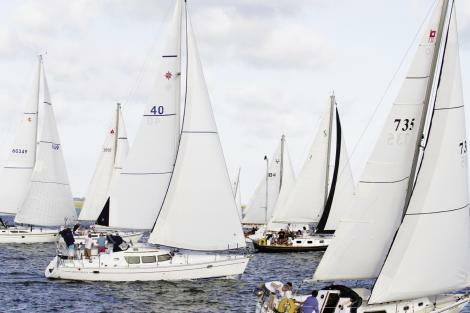 All Hands on Deck: Every April, CORA hosts nearly 300 boats during the popular Charleston Race Week. The dedicated crew of Dauntless lives up to the boat’s name, hiking out to ballast the boat and shave seconds off its time. Dauntless came in third in its division last spring. Cheering Section: Guests aboard Fate get an up-close, but laid-back view of a Wednesday evening race. Rigging the boat is serious work—usually. Friendly Competition: Captain Steve Lesniak (center) and the crew of Celadon take a moment before the race to chat with their buddies aboard Fate, another racing boat. But out on the water, they mean business. 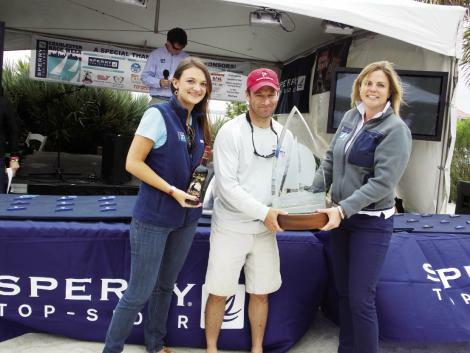 Good Sports: CORA commodore Mike Palazzo accepts the inaugural Jubilee Perpetual Sportsmanship Trophy during Race Week 2013. The award was bestowed on him and his crew for rescuing a man overboard from another boat in foul weather during the race. Celadon makes a run for first place on the last leg. 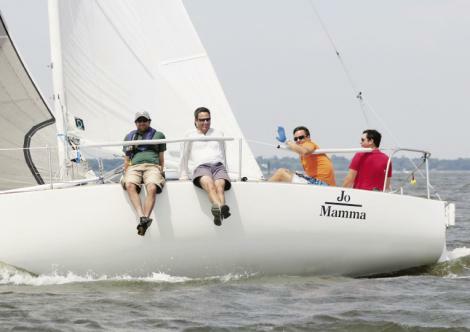 Nice Ride: The Dauntless crew looks sharp as they wait on fair winds during a Summer Series race. 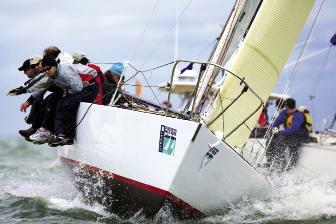 A 47-foot Beneteau captained by Don Terwilliger, Dauntless is a fierce competitor in CORA’s A Fleet. 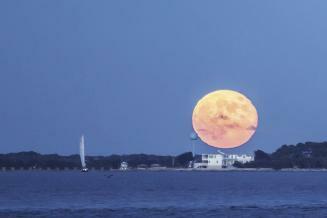 A stunning blue moon rises over a Summer Series race. Cruise Control: Captain Kenneth King and his crew make racing look easy as they sail into the sunset aboard Quintette. Catching A Breeze: (Top to bottom) Captain Eddie Evans and his crew aboard Naut on Call. Mike and the crew of Jo Mamma kick back as they catch some good air. At 10 minutes to start, Celadon is all business. With so many boats navigating such a small area of the harbor, it’s critical that the skipper can see and hear the spotter who is perched like a parrot on the bow. Rival boat Tohidu sneaks up alongside and launches a volley of water balloons at the Celadon crew. Their aim is alarmingly accurate. Good-natured trash talking ensues as Tohidu deftly bears away. To the tourists on shore, the close-quarters maneuvers appear to result in several near misses. Some onlookers are curious, some shocked, and a few clearly want in. Aboard Celadon this evening are a dozen regular crew, a visiting family member, and two savvy tourists who figured out the underground art of catching a ride on a race boat. Like many opportunities in life, it turns out all you have to do is show up with a good attitude. 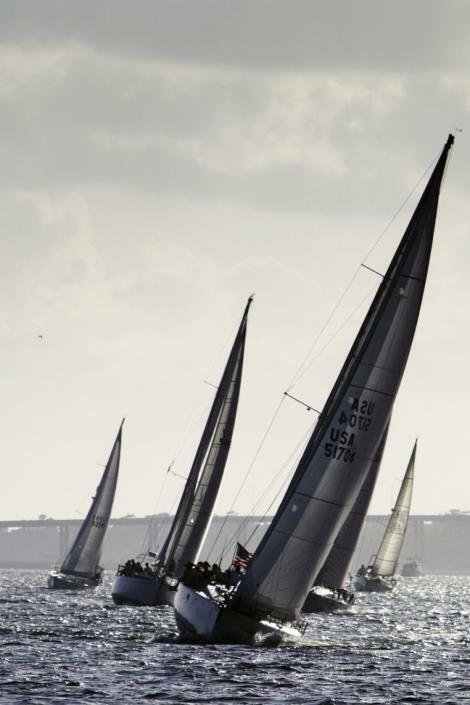 Since its inception in 1967, CORA has organized year-round races offshore and in Charleston Harbor. 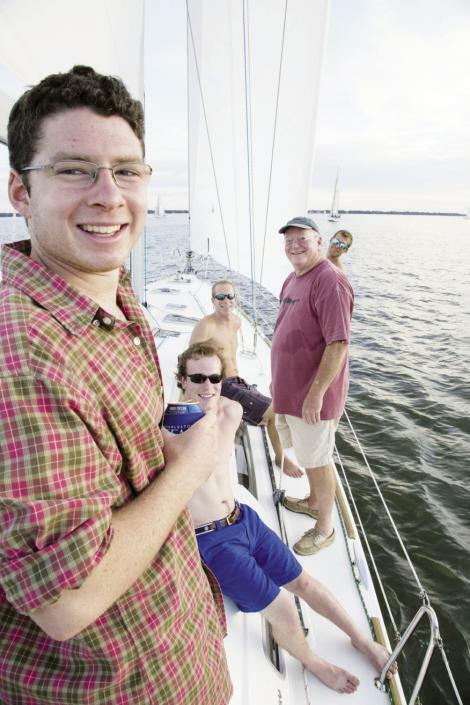 The association also hosts the nation’s largest keelboat regatta every spring during Charleston Race Week. Throughout the year, there are meetings and, of course, convivial post-race parties. Attending one of these meetings (or parties) is a sure way to get a ride. If you’re worried about being a newbie, don’t be. CORA has an extremely rare vibe in they’re a close-knit group, but they’re not a closed-off group. If you show up and introduce yourself, you’ll find a boat before you can finish your drink. “Come to a meeting and ask around. Somebody will pick you up,” says Mike Palazzo, commodore of the CORA fleet and captain of Jo Mamma, an agile J/24. “CORA is about growing the race sailing community. When we get more people out there, it helps the whole sport.” If you’re envisioning Thurston Howell right now, that’s not quite right. Mike is a much younger, hipper, less ostentatious version, and as commodore, he does more thankless planning (along with the rest of the race committee) than he does bossing people around. Eddie Evans, captain of Naut on Call, agrees with Mike’s “the more, the merrier” philosophy: “The more people on my crew, the more people I have to blame,” he jokes. (Actually, he may not be joking.) “Before I joined CORA in 1998, my boat was just sitting at the dock all the time,” he says. “Racing seemed like a good way to get out on the water more. I was intimidated at first but found out it’s really fun.” Naut on Call, a competitive Beneteau 381, went from sitting at the dock to winning CORA’s 2012 Boat of the Year award. “Boarding a sailboat is essentially like going to someone’s home,” says Rob Stein, a 45-year veteran sailor and captain of Kinetic, a sleek J/111 that is a regular contender for first place in her class. “Respect the boat and the captain.” In other words, be nice and don’t show up empty-handed. There’s also some basic etiquette to observe: Wear non-slip shoes with a white sole. Leave your ego at the dock. Ask what you can do. And, after the race, help clean the boat. It’s also good form to bring enough refreshments to share, especially with the captain. These boats are expensive to own and maintain, so bring the good stuff. However, race boats aren’t party boats. It’s okay to drink, but it’s not okay to be drunk. You need to be on your toes. Also, be prepared for it to get a little intense at times. A race isn’t the place for small children or those with terribly delicate sensibilities. 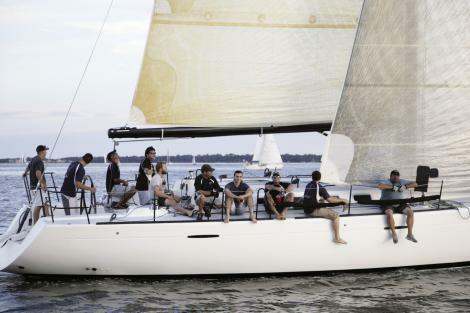 If you want to bring your kids or try out racing in a controlled environment, take a private charter on Fate, a sharp Beneteau 49 captained by CORA member Dustin Ryan. Aboard Fate you can work or you can just watch, picnic, and heckle other boats. Either way, if you don’t have fun on this yacht, it’s your own fault. Back aboard Celadon, crew member Dawn Truog is giving the safety talk to this evening’s newbies: “Keep your head below the boom, keep your feet away from the sheets and lines, pay attention to what’s going on around you, and if somebody tells you to do something, do it quickly,” she says. Don’t be offended if someone yells an order at you. Take it as a compliment; it means you’re part of the crew. As if on cue, Celadon’s vigilant tactician Bill Lynch yells: “Yellow shirt! Take in that line!” Yellow Shirt, a lemon-shirted tourist whose real name is Jim, quickly does what he’s told and earns his ride. 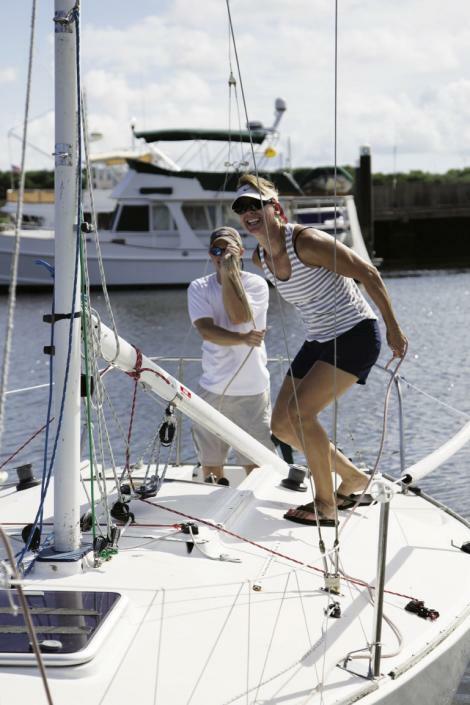 The regular crew aboard Celadon, and those aboard all the boats in the fleet, earned their rides by following sailing etiquette—and by being loyal. After the race, CORA members convene at the Charleston Yacht Club. Mike and the hard-working race committee have burgers and brats on the grill, and there’s plenty of friendly ribbing going on at the bar. Veteran sailor Priscilla Parker looks around the room with obvious affection. “You know, they’ll never talk about it, but this small group helps raise an incredible amount of money for leukemia research,” she says. 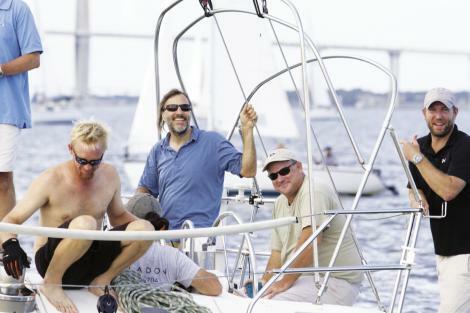 Over the course of 16 years, CORA sailors have participated in the annual Leukemia Cup Regatta, which has raised nearly $2 million for cancer research. “This is a team sport. We watch each others’ backs,” Mike says. “It’s the most fun when you embrace the fellowship instead of the competition,” Eddie adds. At the heart of it, CORA is about fun and friendship, and loyalty and commitment are the foundations. That’s the last but most important rule of race sailing: Once you’re assigned a job on a boat, the rest of the crew depends on you. Stay with your boat, learn her rigging, learn your job, and you’ll be rewarded with the best friends you can ask for, plenty of excitement, regular communion with dolphins, and breathtaking vistas of the Holy City beneath orange sherbet skies—all for the price of dedication and good beer. CORA membership is $35 per year. 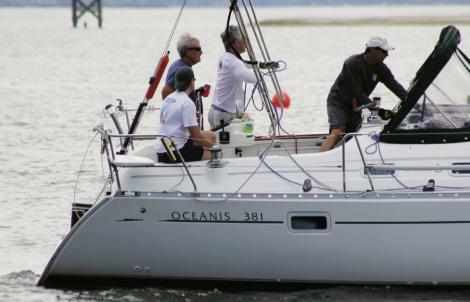 For more information on the association and how to join, as well as a schedule of annual events, visit www.charlestonoceanracing.org. To check out the action in a laid-back way, charter the sailing yacht Fate. For rates and info, visit www.charlestonsailingcharters.com. 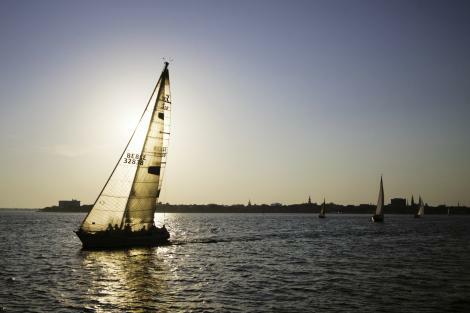 For a comprehensive online resource for sailing in Charleston, visit www.sailcharleston.org.